Hi everyone it’s Cindy here. 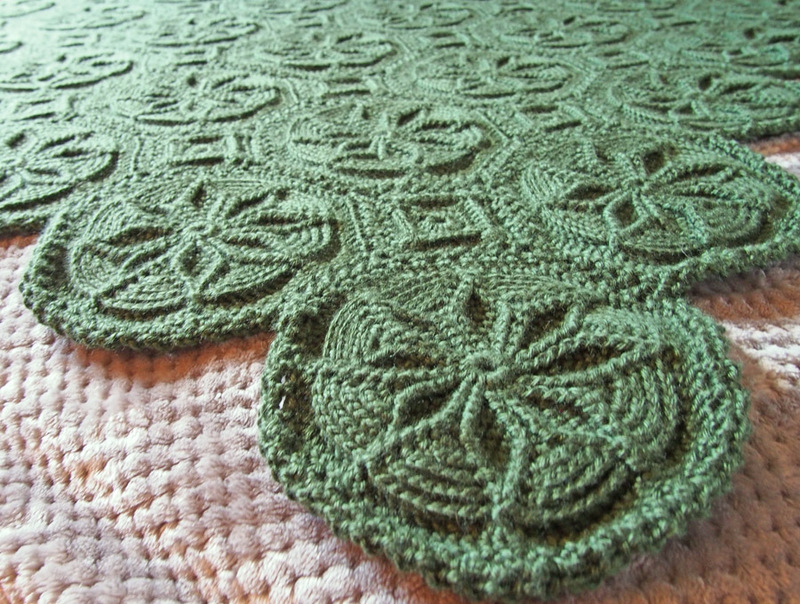 Today I’m joining the Hookin on Hump Day blog hop to tell you about a new afghan I made. This is a project that I’ve worked on, off and on, for the past couple of years and I decided at the beginning of the summer that it was time to finish it. 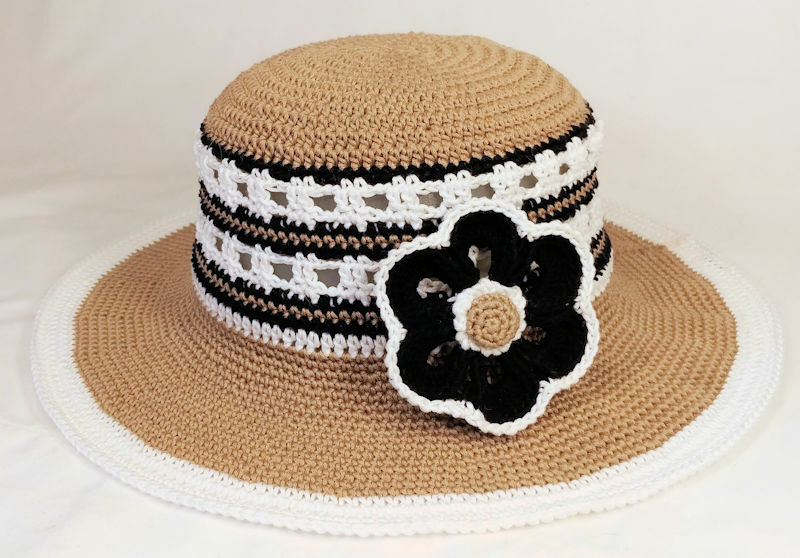 The design is from a collection from Priscilla’s Crochet. 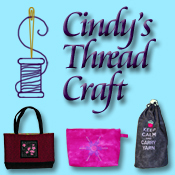 She can be found on her website or on Ravelry. 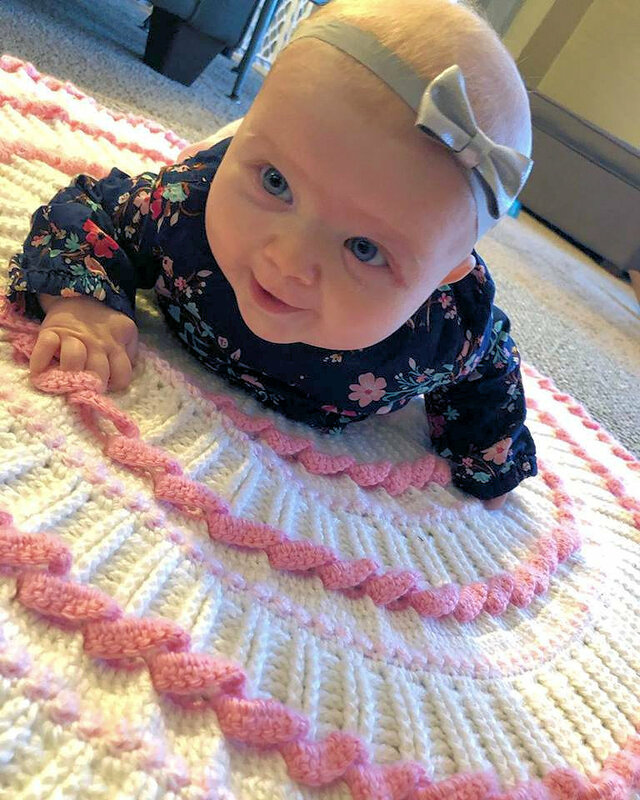 This afghan is from her Matelassè collection and is the same collection that I used for the baby blanket I made last year. 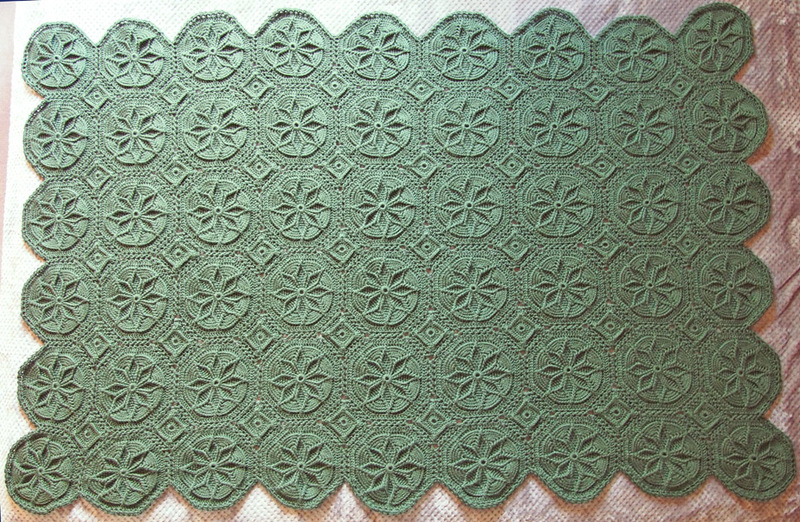 The afghan is made up of octagon and square motifs. 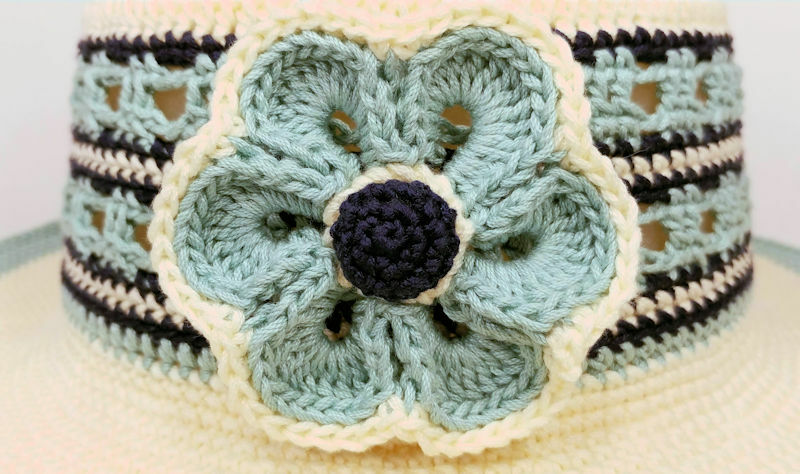 The pattern is called Grenoble and consists of octagon motifs that are joined together using a flat braid join. In between the octagons the spaces are filled in with square motifs. 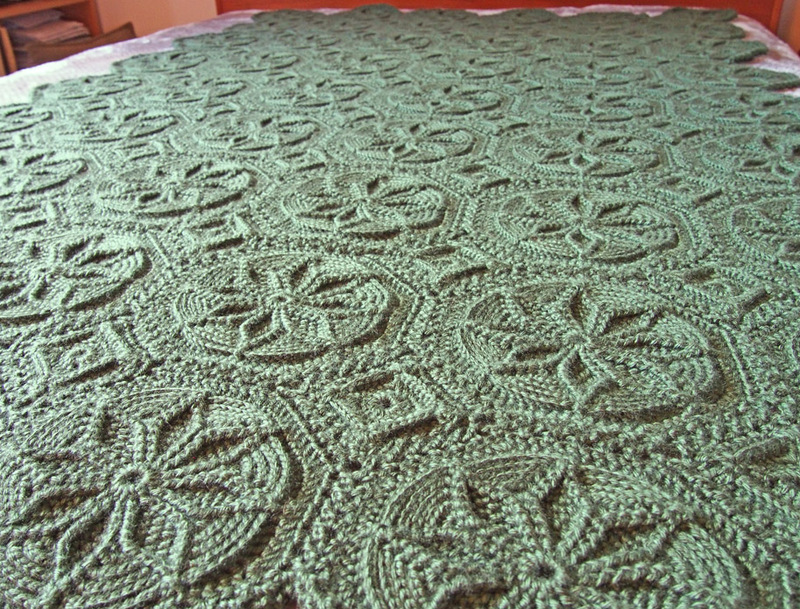 I wanted this afghan to be big enough to cover Charlie so I finished it using 9 x 6 octagon motifs. The final size is about 72″ x 50″. I used Caron Simply Soft in Dark Sage and it took 14 skeins to complete it at this size. Even the back is attractive. One of the things I like about this pattern is that the back looks nice too. The textured style uses a lot of front post and back post stitches which creates a very dense fabric. 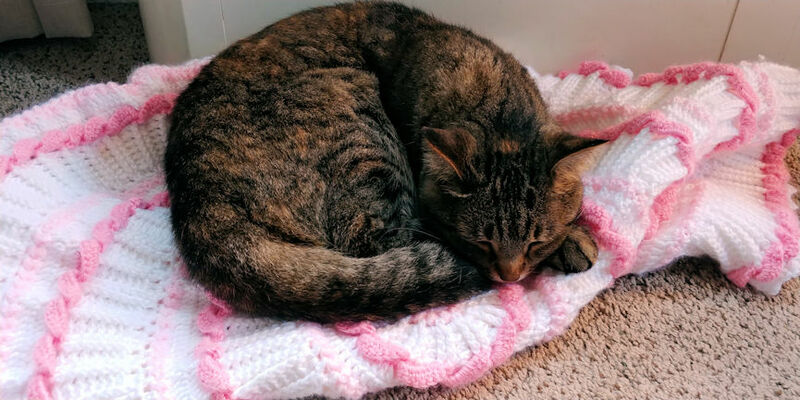 It makes an afghan that is very warm and cozy to lay under. The pattern is well done and easy to follow but I found reading the words to remind me what to do for each round became tedious. To make it easier I made a chart of the pattern for the octagon. It was much easier to figure out where I left off if I put the project down for a little while after I created the chart. 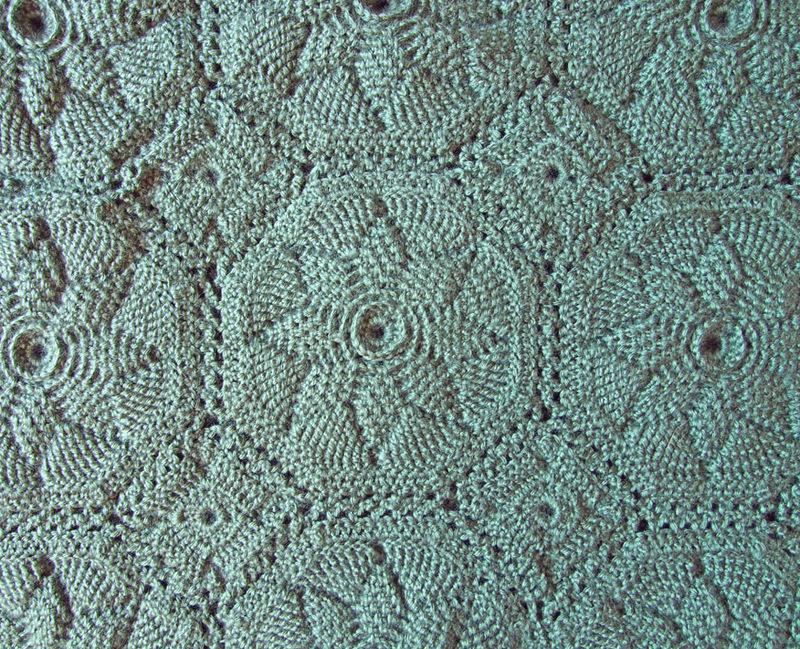 After all the octagons and squares were put together the edge is finished with a simple stitch pattern that mimics the style of the flat braid join used to put all the blocks together. 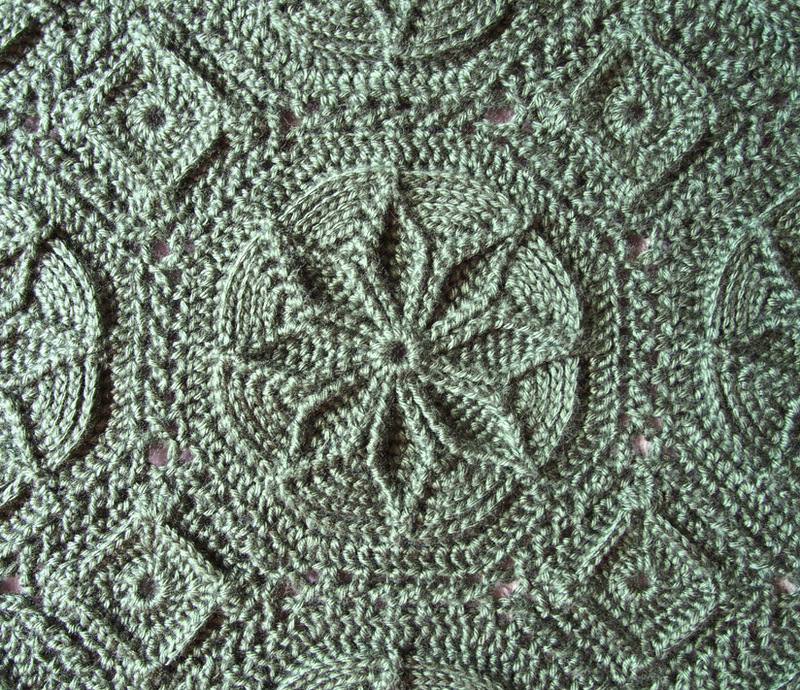 I’m happy with the way the afghan turned out and like all the Matelasse patterns I’ve done so far. I wish you could see the color in real life because the pictures don’t really do it justice. Hi everyone it’s Cindy here. 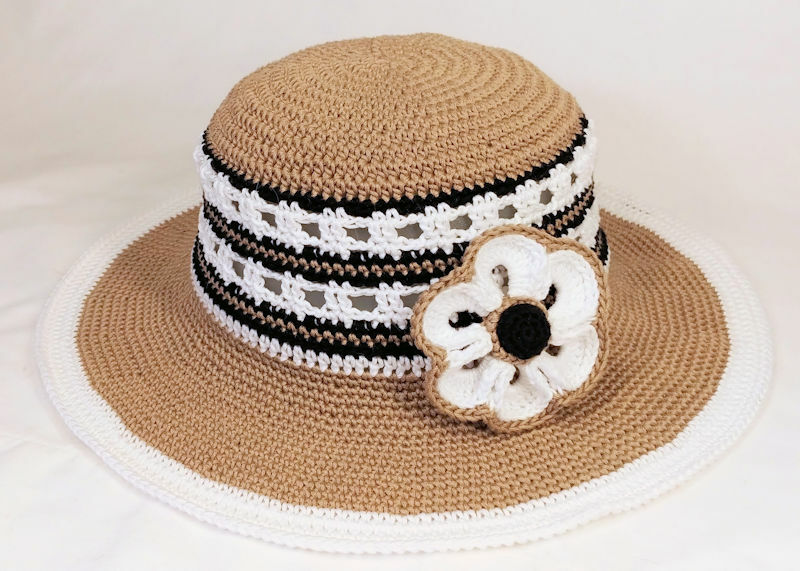 It’s been a while since I told you about my crochet projects so today I’m joining the Hookin on Hump Day blog hop to tell you about a couple of sunhats that I made. 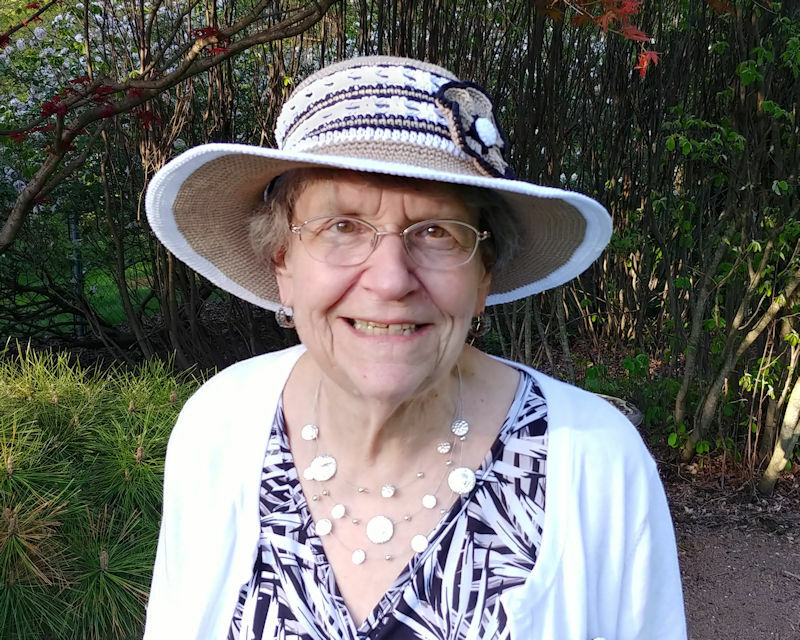 If you’ve been following my blog for a while you may remember that I made a sunhat for my mom for Mother’s Day 2017. She took that hat with her when she visited her brother in Arizona this past winter and wore it many times. When she returned home she said how much she loved that hat but since it was navy blue she couldn’t wear it with some of her outfits and would it be possible to get one with more neutral colors. Since Mother’s Day was approaching again, by the time my mom returned from her trip, I picked out a nice khaki and used black and white for the accent colors. 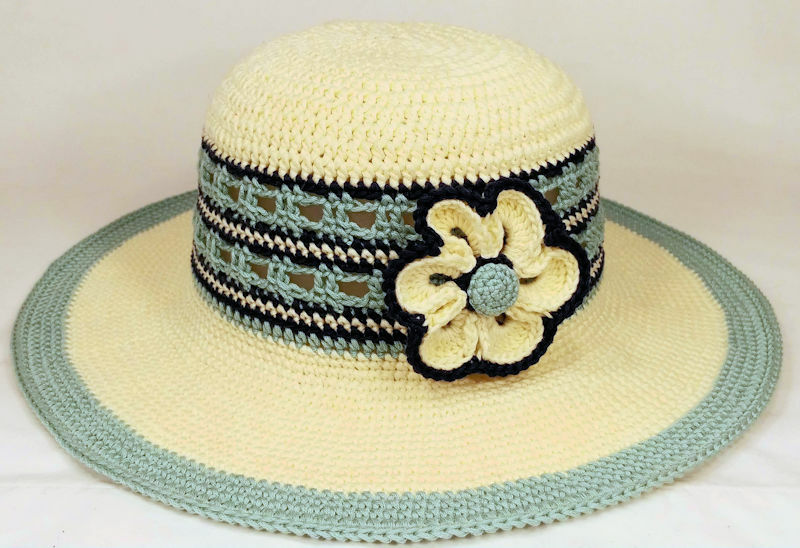 I used the same pattern for the Sheer Southern Style Sun Hat by Kathy Lashley as the previous one I made. 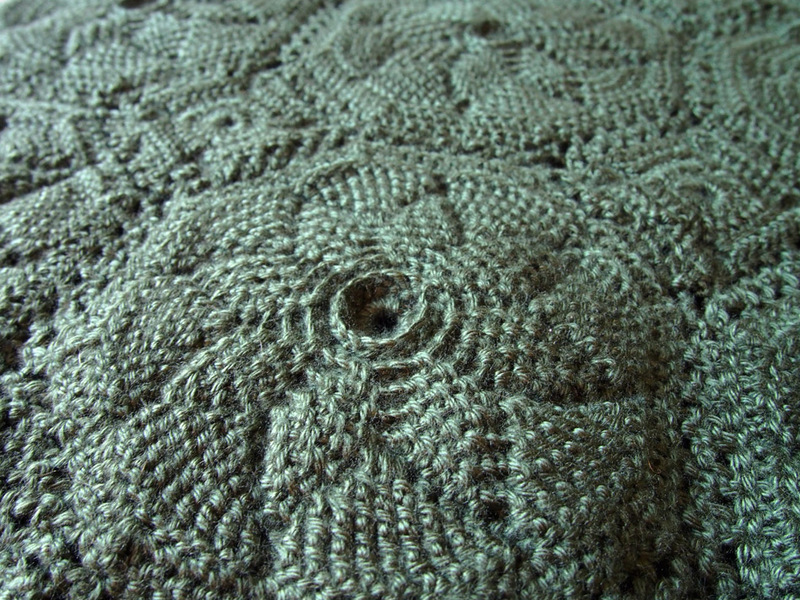 The yarn used for this pattern is Omega Sinfonia DK-weight yarn which is the same yarn I used for the first hat. As you can see from the pictures above I also added three pins she can use to accessorize with. Needless to say she loved it and has been wearing it all summer long. In addition to the hat I wanted to give her something to safely store the hat in. 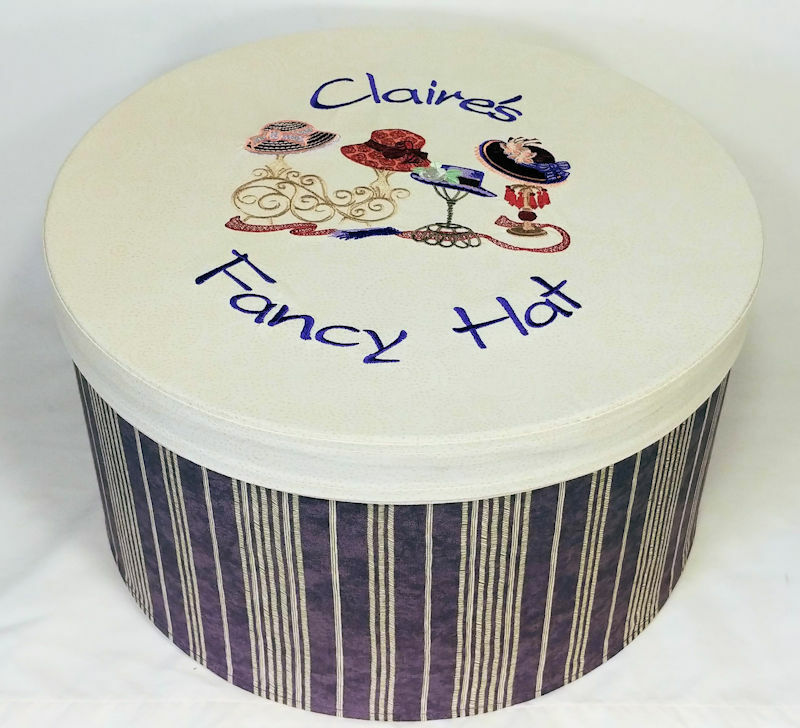 After scouring the internet I discovered that Joann’s had the perfect sized hat box. 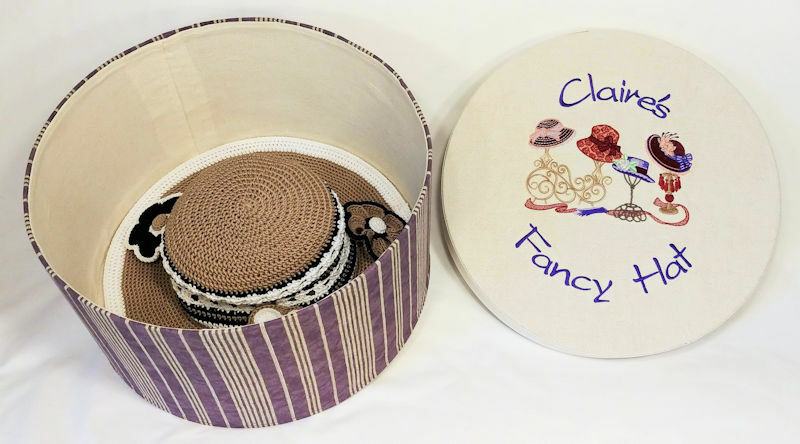 I found a fun hat embroidery and added some lettering to create the top of the box. With a little sewing and some spray on glue the box was covered and lined. I love how it turned out. 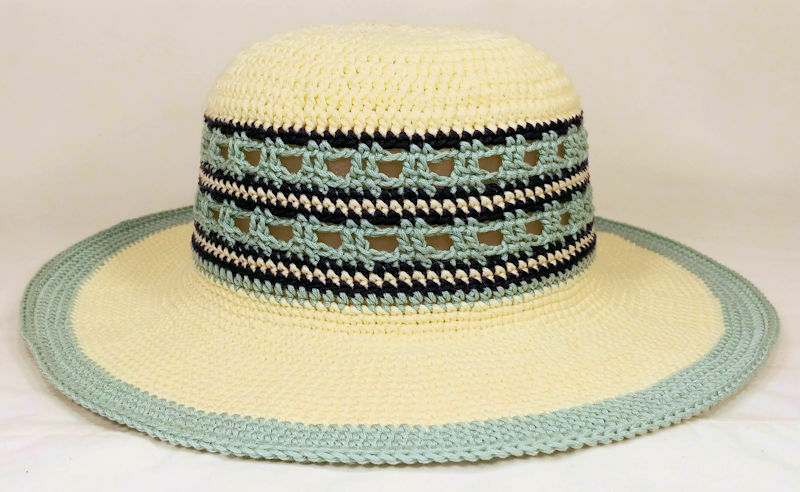 While I was working on this hat for my mom one of the young ladies in a group I get together with to crochet and knit told us she was just diagnosed with ovarian cancer. 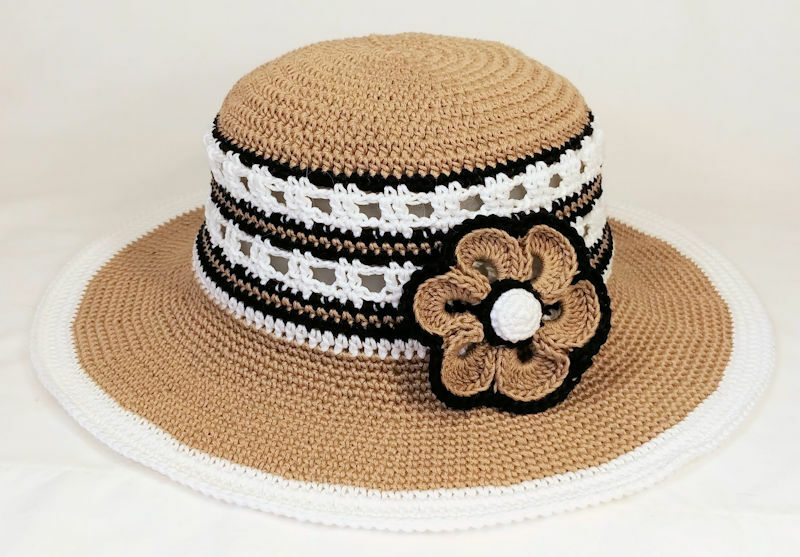 She knew she would be losing her hair during her treatment this summer and wondered if I could make a sunhat for her too. Hope picked out the colors of cream with light teal and navy accents. Just like with the other hats I made a couple of pins to go with it. 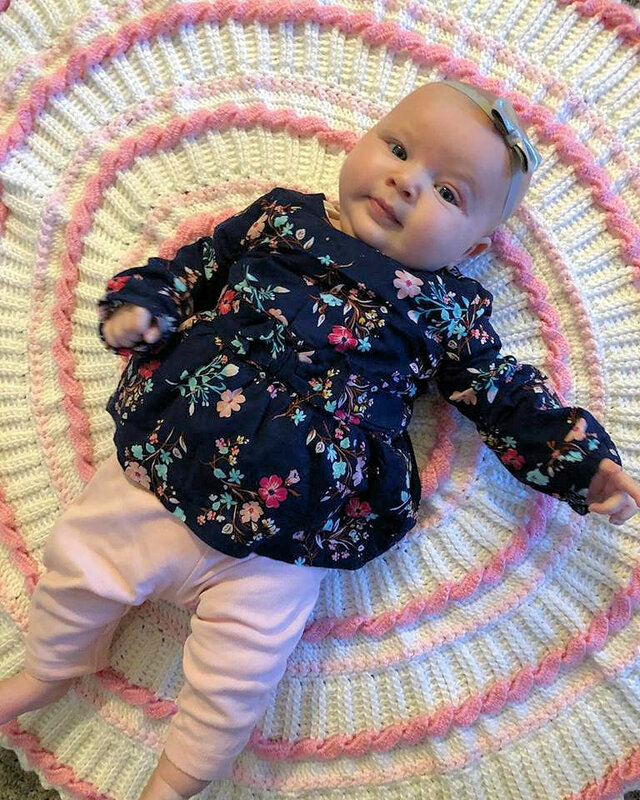 I don’t have a picture of Hope wearing her hat but this past weekend we had one of our get togethers and Hope told me of how much she wore it on a family vacation. She even had to rescue it when a gust of wind blew it off her head and sent it flying into the ocean. My maternal grandmother died from ovarian cancer when I was about 1½ and I have no memory of her so I was more than happy to help Hope with this small gesture. She offered to pay but I only let her refund me for the materials. Hope is doing well on her fight against her cancer but I’m sure she would appreciate any crossed paws or prayers you could send her way. 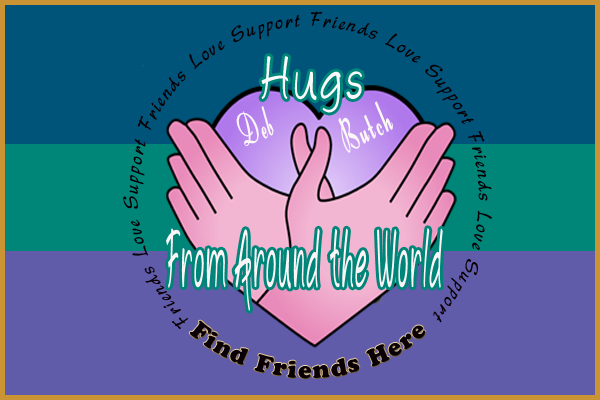 Hugs From Around the World! Hi everyone! It’s Millie & Walter here. Today we are joining our Blogville friends, Hailey & Zaphod (visit their blog to see the blog hop), in sending all the hugs we can to The Three Little Pugs, their Mom Deb and Dad Butch. 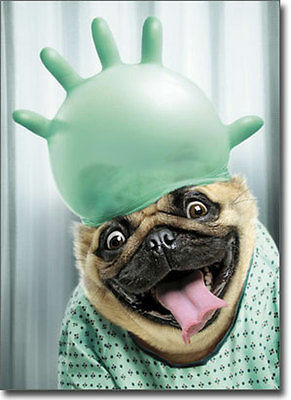 As many of you know Butch had an accident at work a couple of weeks ago and has been hospitalized since then. To add to the stress Deb’s mom is currently battling breast cancer. We just want them to know that all of us are here for them and wish we could be there for them too. 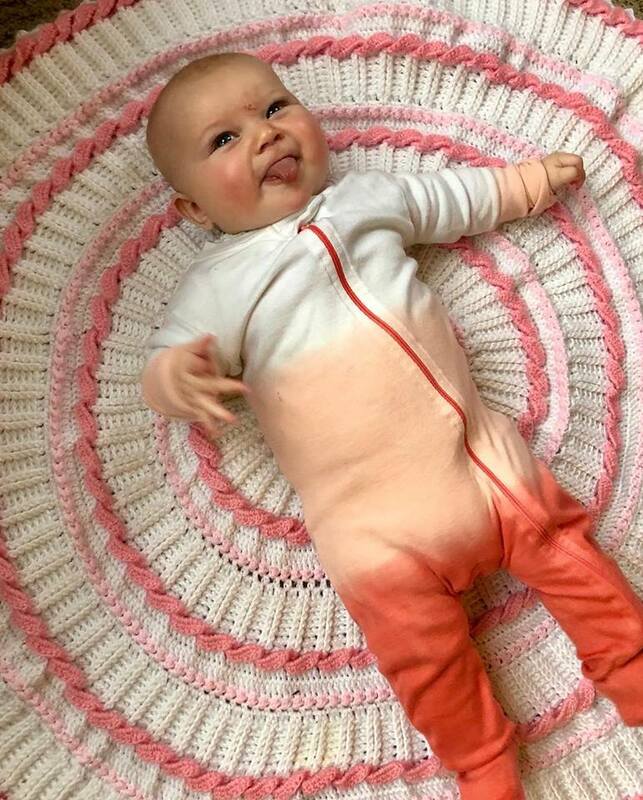 Millie is going to kick things off by showing her technique. Nothing better than a big kiss and hug to start your day! Now it’s Walter’s turn. 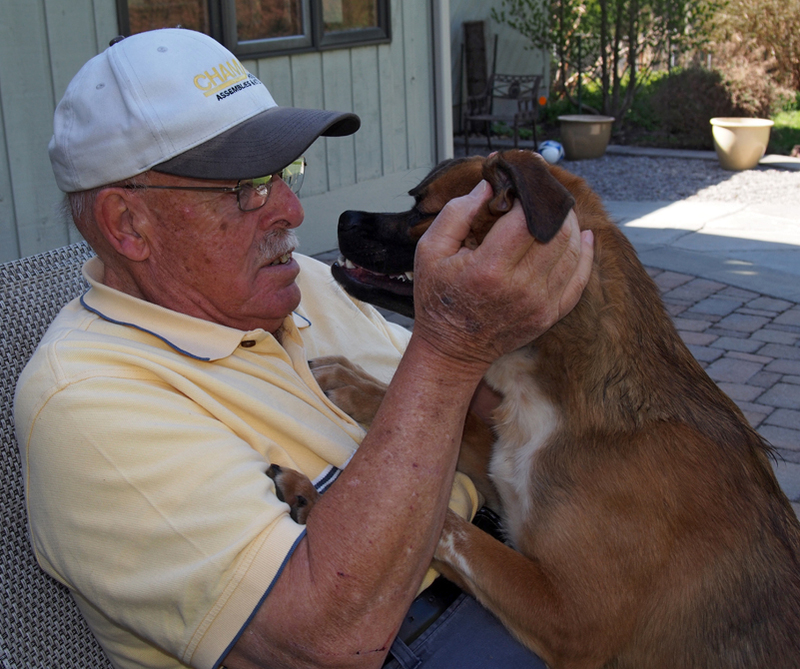 Here he is giving our Angel Grandpa Chuck a hug and kiss too. I loved giving my Grandpa a hug and kiss. If we were in Iowa with you we would smother you with hugs and kisses. Of course we would be very gentle with Butch since he is hurt. As our mom said, one of the saddest things about being Blogville residents is that the only support we can lend someone in distress is our prayers and comments. If we lived nearby we would be sure to lend our support by keeping the pugs company while their mom Deb was visiting their dad in the hospital or bringing a meal to your family. 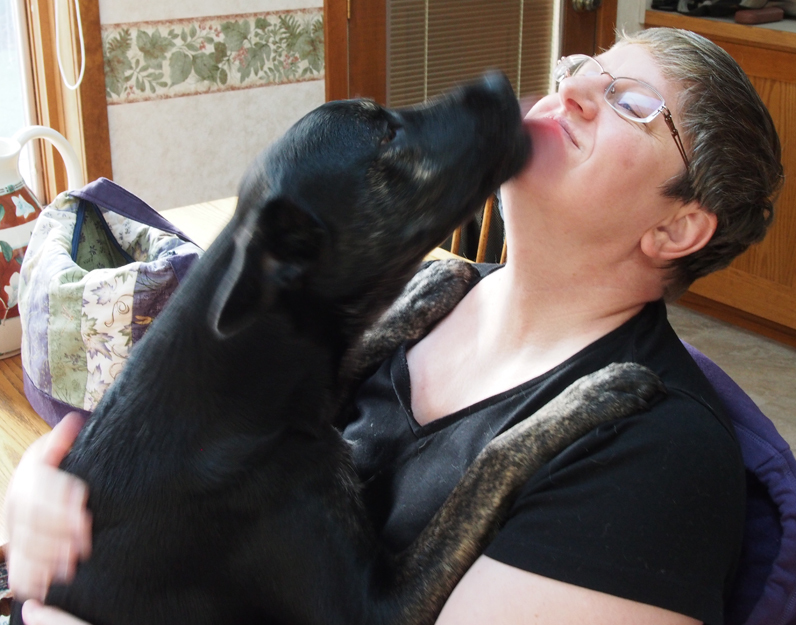 We hope the Stella Rose, Angus Mac, and Maggie Mae won’t mind us sending these hugs to their pawrents. We are sure when their dad comes home he will be smothered with love from them too. Hi everyone! It’s Cindy here. 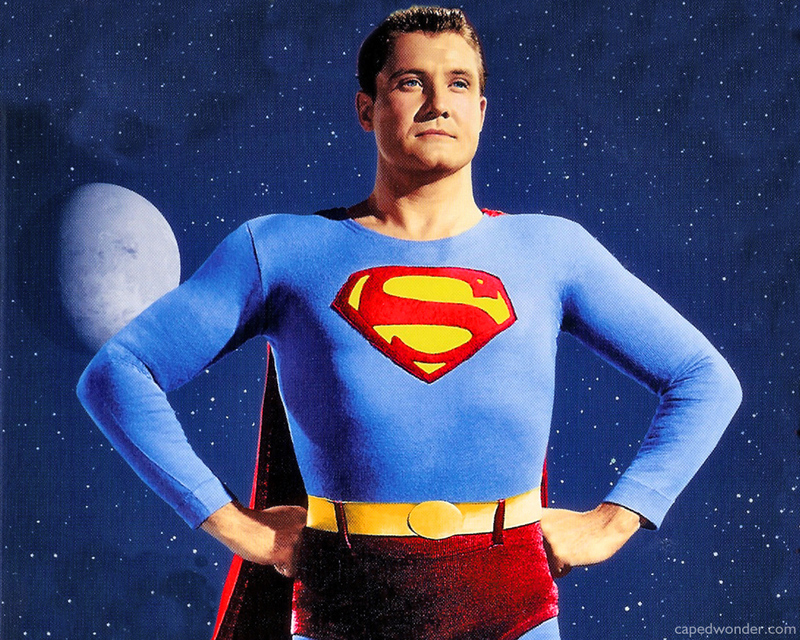 When you were a kid did you ever watch TV shows like The Adventures of Superman and wish you had super powers like him? I know I did. Of course I really wanted to be Samantha from Bewitched. 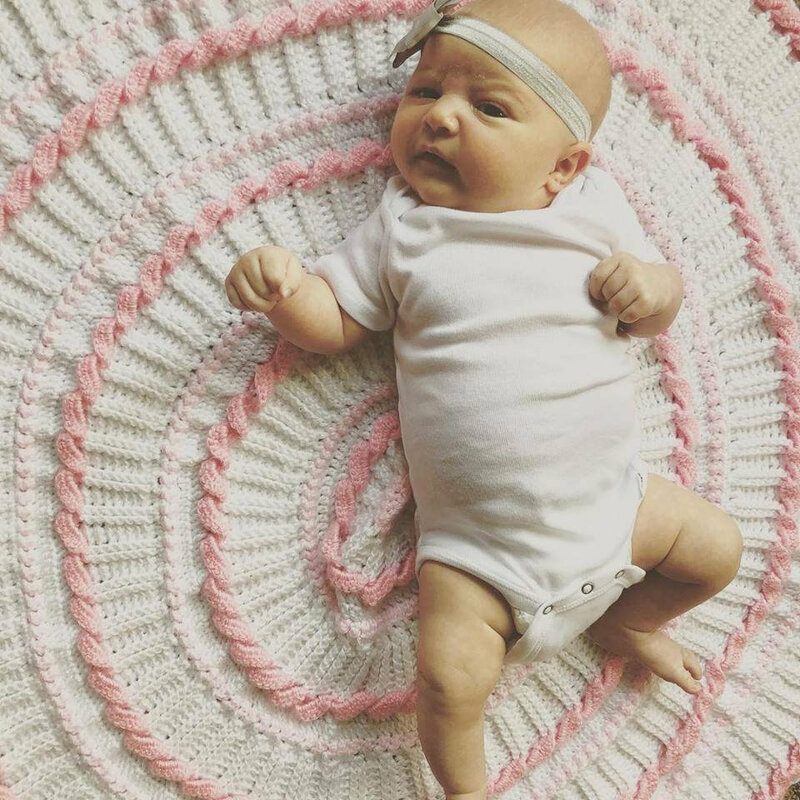 Just a wiggle of her nose or a blink of her eyes and everything would be better. 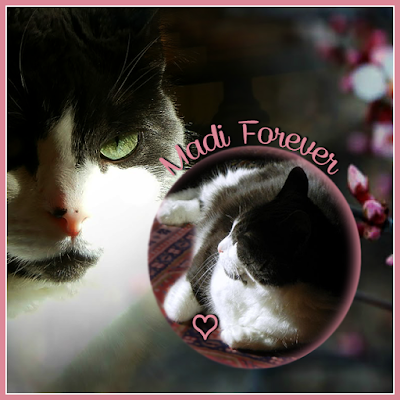 We’ve all had someone or somepet in our lives that has suffered from some sort of health problem and wished we could do something to make them better. Here in Blogville there is always somebody in need of our Power of the Paw support. If we had those super powers like Samantha did we could wiggle our noses and make everyone better. Sadly we know that isn’t possible so we do what we can by putting our paws together, saying prayers or sending all the positive vibes we can. Recently one of Blogville’s residents shared with us about a young girl that has been battling a mysterious health problem. 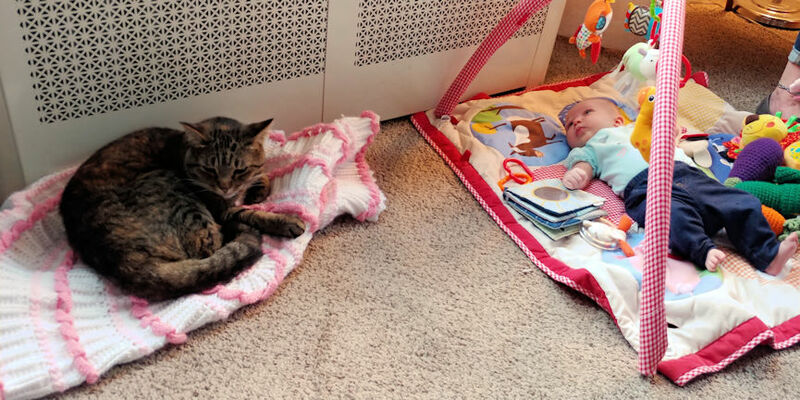 Just like with our pets it can be more upsetting when a child has health problems because it is difficult for them to understand why things aren’t normal. I’m talking about Macey the granddaughter of the author of the Three Little Pugs blog. If you haven’t been following Macey’s story you can go here to read a little about what has been going on. A couple of weeks ago Macey had some scary tests coming up and I wanted to do a little something to help her get through it. 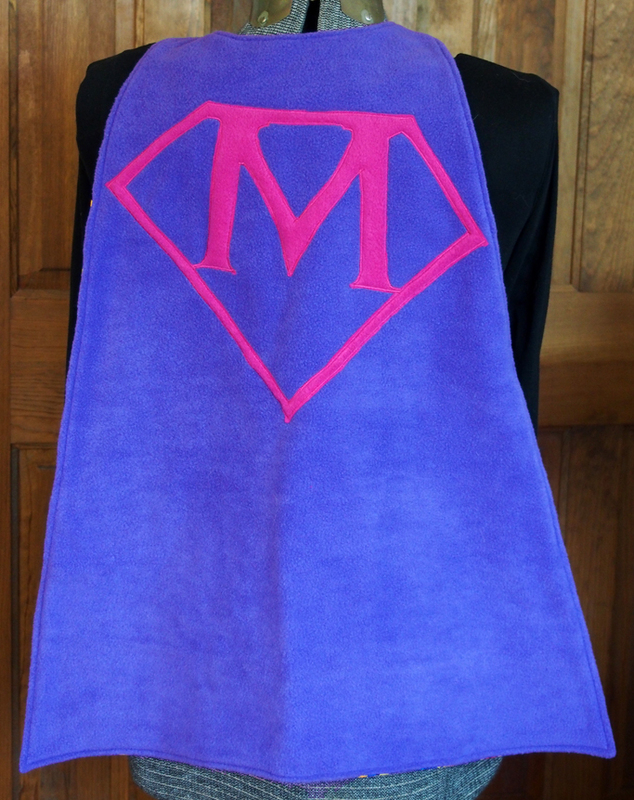 Being the crafty person that I am I fired up my sewing machine and created a cape for Macey to wear whenever she needed some super powers. 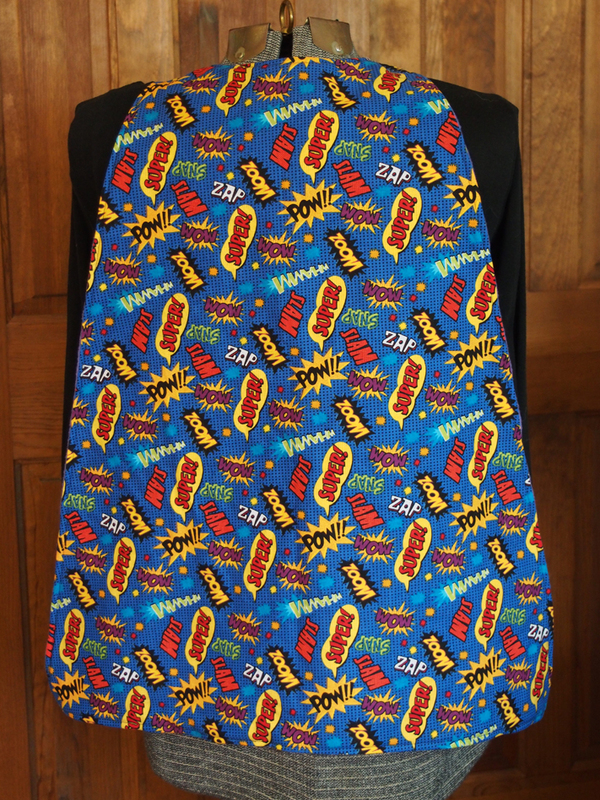 It’s made of fleece on the outside and the backing is a fun cotton print. 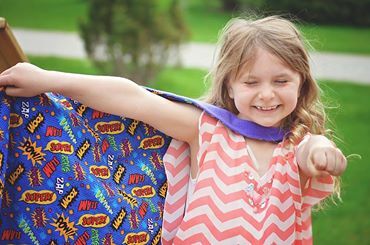 I hope the cape helped Macey feel stronger during her tests. The one thing I do know is that she will know that people all around the world are worried about her and hope she feels better soon. 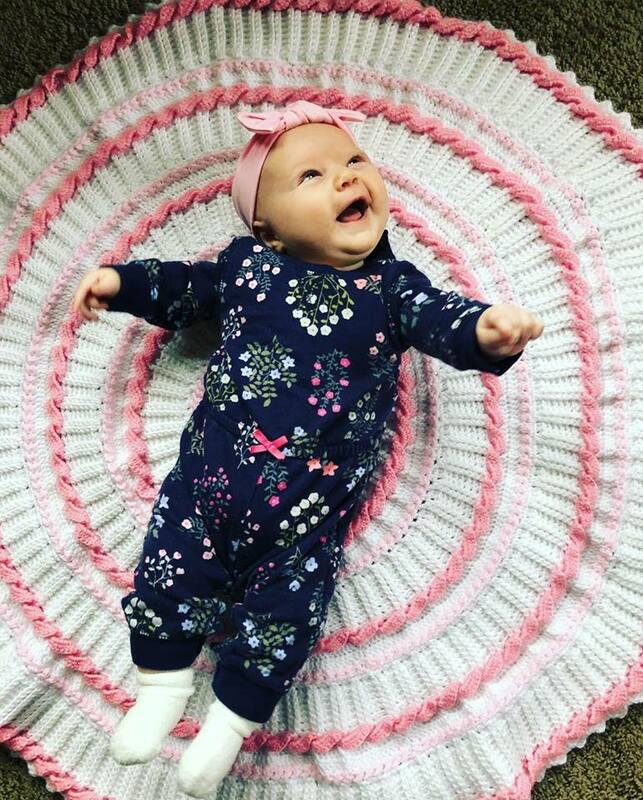 The cape is in her two favorite colors, purple and pink. 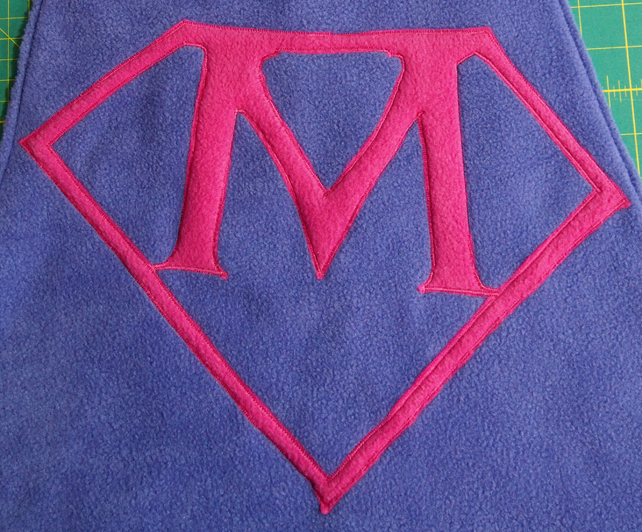 It was a challenge sewing the “M” on the cape with the stretchy fleece fabric. I used a tight zigzag satin stitch and had to be careful to make sure it didn’t go too wonky. Another challenge I had was figuring out the correct size for a 6 year old girl. Of course I used my friend Google to help me. I found a few patterns and put them together to come up with my pattern. I used Velcro at the neck to allow for easy on and off. As you can see by the above picture it fits her great and even allows for her to grow a bit and still fit her. 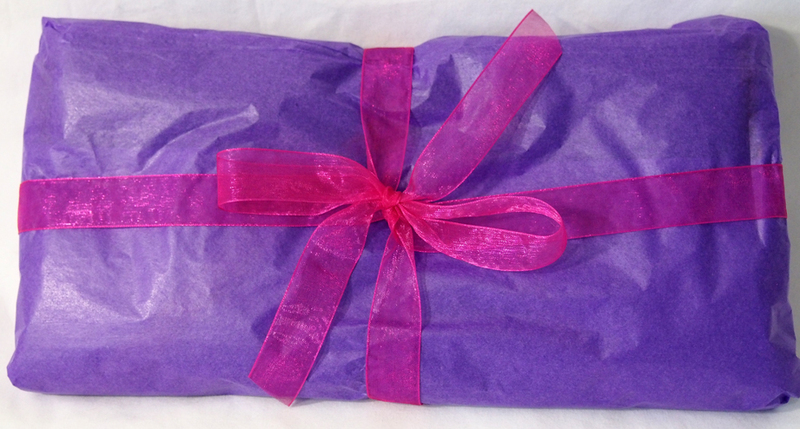 I wrapped the cape in purple and pink and included a funny get well card with a pug on it. 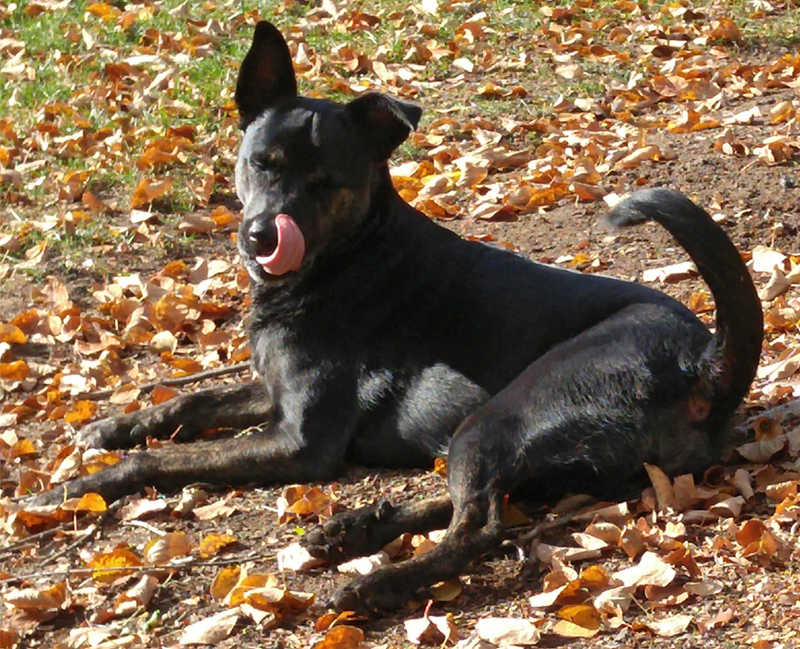 Not sure what they’re giving you…but I want some! 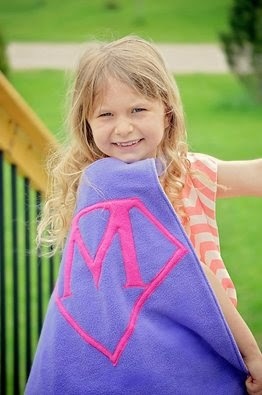 I enjoyed making the cape for Macey and seeing her smile in her pictures made me smile too. If you don’t already know The Three Little Pugs you should go visit them and say hello. You could also include some encouraging words for Macey as I know her grandmother shares them with her. Get well soon Macey!